VANCOUVER, April 8, 2013 /CNW/ - TD today announced a $75,000 donation over three years to Ronald McDonald House BC/Yukon as part of its capital campaign to build a new house located at the BC Children's Hospital site. "A new Ronald McDonald House in Vancouver is critical to better serve the needs of seriously ill children and their families who must travel long distances to access necessary medical treatment," said Richard Pass, CEO, Ronald McDonald House BC. "We would like to thank TD for its generous donation to our capital campaign which brings us even closer to our goal to serve more families in need." The new Ronald McDonald House, expected to be completed in the summer of 2014, will provide additional facilities and services that will enable families to stay with their children and keep their lives moving as normally as possible. "TD is pleased to contribute to this worthwhile campaign to build an even bigger Ronald McDonald House in the region," said Jane Russell, Senior Vice President, TD Bank Group. "The families who rely on Ronald McDonald House are dealing with a great deal of stress and finding an affordable and comfortable place to stay should not be a burden. We know this donation will benefit many families who are receiving world-class care at BC Children's Hospital." 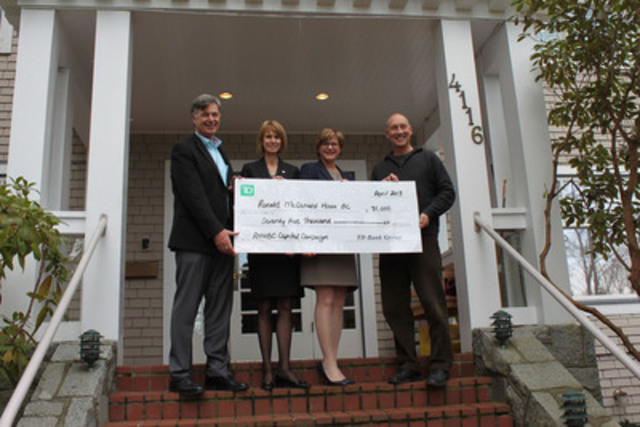 TD is a long-time supporter of Ronald McDonald House BC/Yukon and has helped raise more than $200,000 since 2006 through annual fundraising efforts.